Chico State is conducting a campus-wide student Climate Survey called Chico Speaks running from April 9 through April 29, 2018. On April 9, all Chico State students — undergraduate and graduate — will receive an email from the university with the link to the Chico Speaks survey. This confidential online survey is about incidents of certain types of sexual and physical experiences in relationships, as well as some of the community attitudes and behaviors that are seen around campus. Participation by all students is crucial if we are to truly understand the ways in which these matters affect our university, so it is important to hear from all students – even those who think these experiences do not affect them personally. Students who complete the Chico Speaks survey will be prompted to click a hyperlink to exit the survey and then redirect to the Chico Speaks Prizes entry webpage. Prizes include iPads, concert tickets, a cruiser bike, and more! Additionally, the first 1500 students who enter the drawing will receive a $5.00 credit added to their Wildcat Card to purchase a coffee or other drink from AS Dining Services. There is also a major prize for the student organization that best helps to promote the survey. 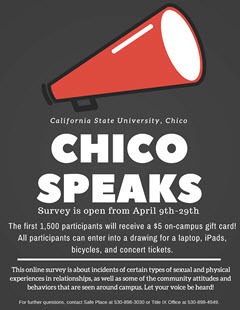 Your entry into the prize drawing cannot be connected to any of your Chico Speaks survey answers. See our Prizes webpage for more details. Questions? Please check out our FAQs below or contact the Title IX Coordinator’s office at titleixcoordinator@csuchico.edu or 530-898-4949.